We're a hard technology-focused country. We like to think that our most advanced and destructive weapons are gleaming, shiny tubes of metal filled with high-density circuit boards. With a few keystrokes, we can destroy the world. Thomas Frank might suggest that this perception is yet another example of the sort of misdirection that he chronicles in 'Pity the Billionaire: The Hard-Times Swindle and the Unlikely Comeback of the Right.' All that tech is impotent compared to the weapons he describes; lies, more lies, and language bent to serve the purposes of the few at the expense of the many. World War Three may already be underway. The weapons being deployed are muddlement, mimesis and a self-inflating chutzpah that can transform the general population from employees to serfs with a few well-placed lines of tax code. 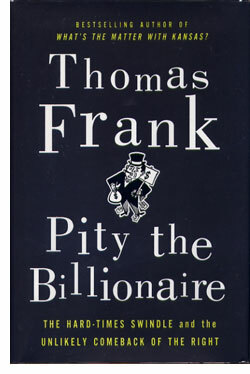 'Pity the Billionaire' is a left-leaning political look at the language of politics, but Frank is dispassionate enough to leave all true believers on either side of the equation uncomfortable. He does so by asking unhappy questions; how could a country whose economy has been wrecked by a set of economic policies be convinced that the very tactics that brought about our ruin can, if ramped up to a greater degree, bring about our success? That's the question at the core of this very entertaining and illuminating look at language and politics. Frank fights fire with fire. To understand how we could manage to ignore history, that is the lessons of the Great Depression, he takes us back for a brief trip to 1929, and then compares our reaction then to our reaction now. To help readers wrap their brains around how the solution to a problem would be to double-down on the tactics that created that problem in the first place, he looks at the language and creates some words of his own. In the process, every word he writes manages to be either gripping, funny, trenchantly observant or all three at once. "Muddlement" is Frank's strongest contribution here. It's the term he uses to describe the process by which perception of a problem and its causes are slowly disassembled, pulled apart and re-assembled to support an argument that is logically inconsistent with the historical evidence and current economic and political reality, for example, the assertion that the answer to the economic catastrophe of 2008 is to entirely abandon regulation of the markets. Another entry in Frank's lexicon is "mimesis," that is, mimicry. Frank demonstrates with laugh-while-you-cry examples how those in the service of what they like to call capitalism are able to co-opt the language not just of the left, but even, in some cases, communism, to sell the idea that Big Money works best if left to its own devices. Frank's ability to describe a whole class of linguistic weaponry with one smart term is both entertaining to read about and illuminating when one looks about on the political landscape. He uses language to give readers the tools with which to dissect the weaponized words that enable multi-national corporations to carry out a relentless agenda of reckless behavior. Frank does so in a manner that is entirely enjoyable to read, without feeling as if one is on the receiving end of a particularly virulent screed. Frank's voice is full of wonder at the predicaments within which we find ourselves trapped. His characterizations are more those of a Road Runner versus Wile E. Cartoon than a political cartoon. It's a subtle difference that allows Frank to revel in his humorous prose voice without ever seeming cruel. 'Pity the Billionaire' is engagingly easy, even fun to read, no matter what your political beliefs are. The real power of 'Pity the Billionaire,' however is in the sophisticated arguments and analysis that Frank makes even while he just seems to be giving the reader a good time. Though he never cites Orwell directly, 'Pity the Billionaire' is at heart an incisive vision of how Orwellian language is being used to wage a hidden war. Like Orwell, Frank is not optimistic. There's a good chance that the war has already been lost. But his readers, armed with the linguistic weapons like "muddlement" and "mimesis," can at least achieve moments of the sort of clear vision that might enable them to understand that a battle is in progress. Talk is cheap, and in this case that's a weakness that can be exploited by both sides. Language can be overwhelmingly powerful no matter who wields the words. All Reviews alphabetized by author. Non-Genre, general fiction and literature. Supernatural fiction, supernatural horror and non-supernatural horror. Science fiction, science fantasy, speculative fiction, alternate history. Fantasy, surrealism and magic realism. Non-Fiction, True Crime, Forteana, Reference.